The Vanguard Guitar Strap is now available on Amazon! The listing for the Mojave color is complete and the Royal Blue is in progress. Amazon has checked in the Mojave inventory and it is now available for purchase. After several months of research, planning, strap design, packaging and labeling trials, communication challenges with various suppliers, the creation of countless spreadsheets weighing options, ordering and testing of various samples, and working through shipping and import hurdles, the first shipment of the first product line for Sovereign Straps has arrived! Next we need to sort through a GS1 UPC issue that is preventing the creation of the Amazon listing, then they will be shipped to the warehouses while product pictures and sales pages are created. It won’t be long now…these should be ready for the holiday season. Stay tuned for more updates on each model. The Vanguard Strap design is now complete, samples have been received, and the first production order has been placed. The order should arrive in about a month. As we prepare for the launch we will be providing updates with increased frequency. Today lets talk about the product tag. The tag is interesting because it is the elevator speech for the product. It attempts to tell the potential customer why this particular item is better than the item next to it on the store shelf. Creating the tag is oddly satisfying after spending months designing a product because you are gathering up the good about the product and trying to make it impossible to miss by the customer. It is remarkably similar to creating a dating profile! So what makes the Vanguard Strap better than the 1000+ other options? It has genuine cow hide leather ends which is honestly rare on Amazon. The market is flooded with straps that advertise “Leather” ends, however, these are PU or Micro leather which are actually synthetic. Honestly, that type of listing is dishonest. Buyer beware! The front strap end has a slot in the leather to allow you to temporarily store picks in the strap end for easy access while playing. The strap has an extra wide cotton backing material. It is 2 1/4″ which is wider than all the woven straps of this type that I’ve seen. Wider straps are more comfortable. Also, the cotton type chosen is soft like your favorite used T-Shirt. It is very flexible and this gives it a broke-in feel right out of the packaging. It conforms to your body which reduces pressure points to make it more comfortable. The Vanguard also uses premium Tri-Glide steel buckles. These buckles are much easier to adjust than the other straps we have tested. You just pull on the buckle and they adjust with no fuss. They are also Galvanic Coated which is very tough. The coating prevents corrosion and gives the buckle a chrome appearance. The strap is a bit longer than most straps. Longer straps cost companies more to make, however, a longer strap also fits more customers. This strap will fit 99% of players. Unless you can reach a basketball hoop without jumping, or walk under a kitchen table without bumping your head, it should fit. Progress continues on development of The Vanguard Strap! Over the last week we have been fine tuning the design and manufacturing process for the genuine cow hide leather ends. On the back end of the strap, the leather will be folded through the buckle and sewn all the way around the edges and the slot. For the front end, two pieces of leather will be sewn together by going all the way around the edges and around the slot as well. The strap itself will be sandwiched in the middle. I personally like the look of the additional stitching and the security of the two ply strap end design. What do you think? The selected manufacturer for The Vanguard Guitar strap is running about 12 trial patterns for Sovereign Straps and they sent me a picture of one of the trials today. The colors are not exactly what we were going for but the weave is amazing (picture in the header). Since the color was a bit off target, I spent a couple of hours tonight reviewing Pantone Swatches with the supplier to prepare to run another sample. This is quite difficult to do electronically. Photoshop is proving to be very valuable for this work, however, it is difficult to pick up actual colors in photos. During October in the USA many people change out their home decorations for the fall. The colors shift black and orange then then more brown as Halloween moves to Thanksgiving. Then the collective decorating skill of the USA seems to fall apart as Christmas approaches. The pattern below attempts to strike a chord (pun intended) with that want for fall colors. I think it needs more orange and the next trial run should be done tomorrow. What do you think? Note that these pictures are of the weave layer only which would be attached to a white cotton base material which brings it all together in my opinion. After many weeks of preparation, discussions, calculations, marketing investigations, and back and forth between 15 different suppliers we have chosen the manufacturer for this first product and have ordered 12 samples of around 3 different design ideas for testing, trials, and quality inspection. With any luck, at least one of the samples will be worthy of being labelled as the first product for Sovereign Straps. 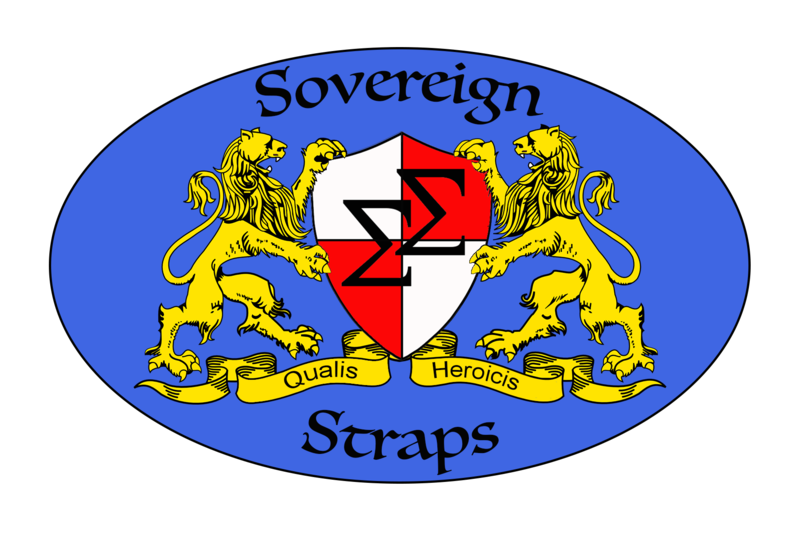 Sovereign Straps is wrapping up the process of developing and sourcing the first product which will be called “The Vanguard” to signify that it will lead the way into battle. We are marching on the competition with products that will win. They will be higher quality, with better features, at an equal or better price, with industry leading customer service.